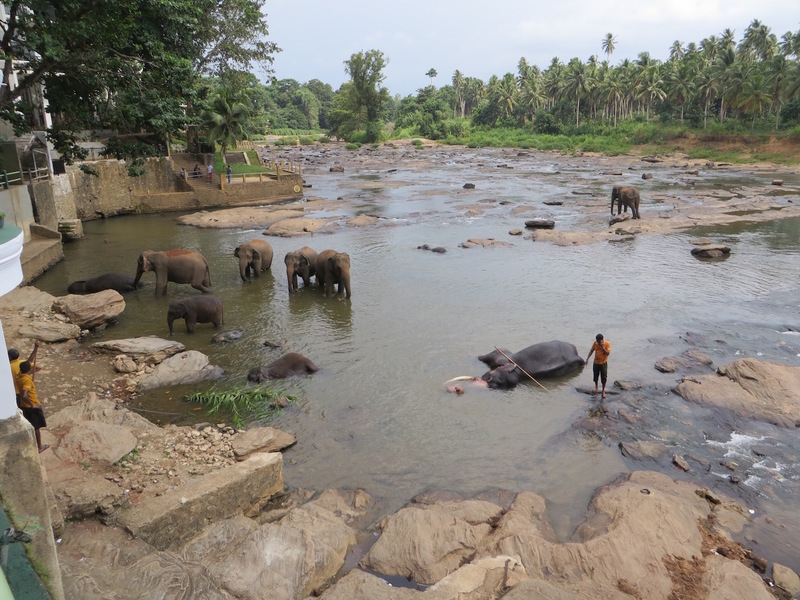 Pinnawala Elephant Orphanage was established in 1975 by the Sri Lanka Department of Wildlife Conservation to provide a sanctuary for abandoned elephant calfs. 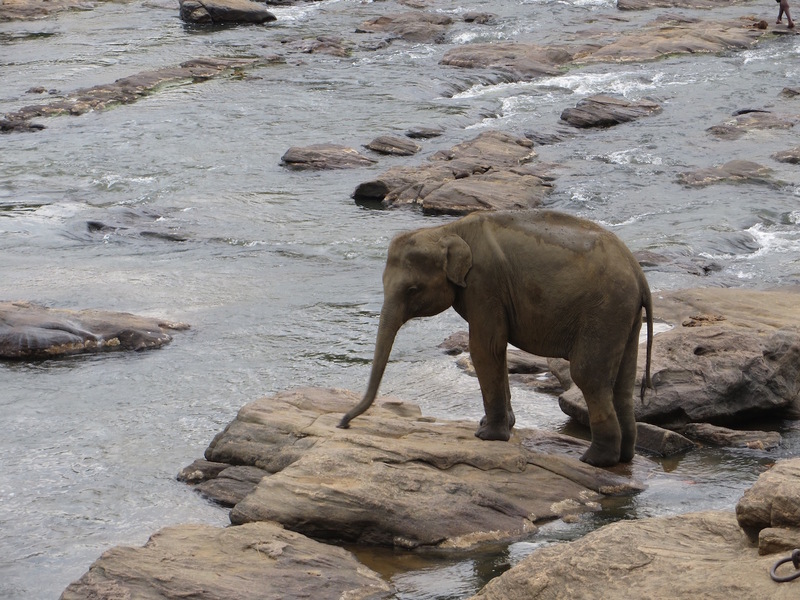 Sri Lanka is about the size of Southern California but instead of coyotes it has thousands of elephants. There are many national parks and protected areas where the animals can live in safety, but elephants wander outside the protected areas and occasionally meet conflict in rural communities. Sometimes Mothers are injured or killed and their babies are unable to survive on their own. 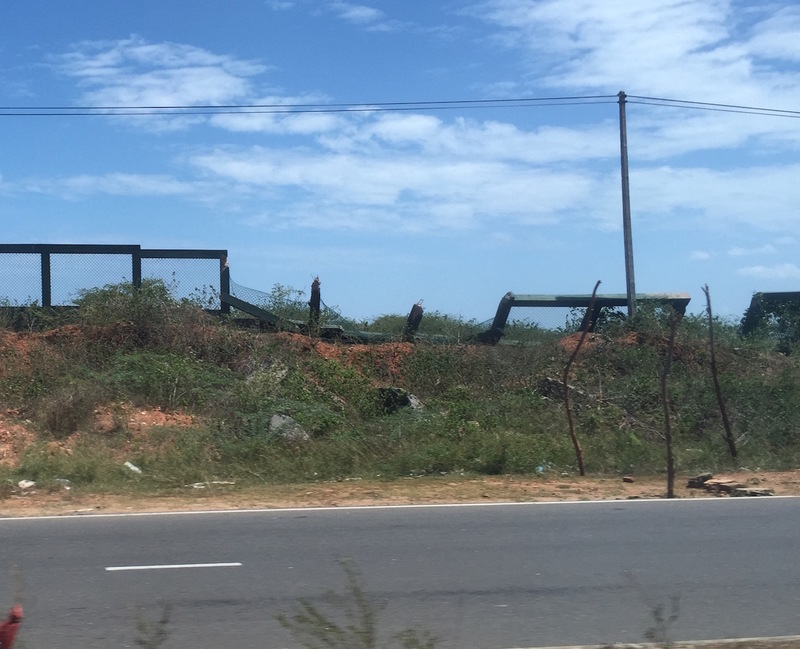 After seeing the damage an elephant can do to a major highway fence, I am not surprised by the drastic action rural community members take in defending themselves. A wild, angry, mama elephant is not something I would like to meet in my backyard. On second thought, I’m not even sure I would want to meet a happy, curious, elephant in my backyard. These animals are enormous! Peter played a quick game of tug-o-war with a baby… who do you think won? Orphaned elephants were added to the Pinnawala sanctuary until 1995. 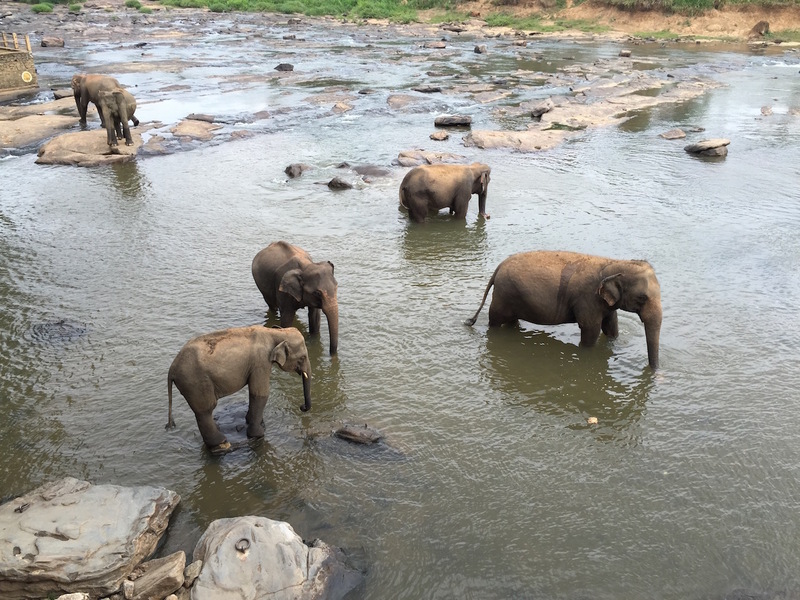 Now any orphaned or injured elephants are sent to the Elephant Transit Home next to the Udawalawe National Park. Here they are raised and released back into the wild. Since 1995, any elephants added to the Pinnawala herd are due to births on the property. The Pinnawala Orphanage is now just a tourist attraction. 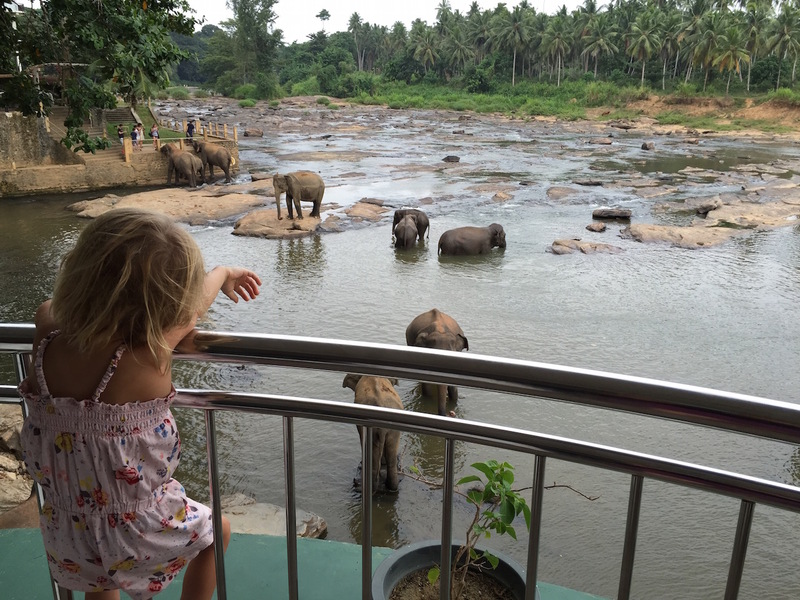 One of my last minute requests to our Sri Lankan guide was to visit an elephant orphanage. Pinnawala was the most convenient stop on our loop. Had I more time to plan, I would have requested a trip to the Transit Home instead. My excitement stalled when I noticed how the Mahout (handler) approached the elephant we were going to feed. The elephant he chose was resting, lying down in the water. The Mahout yelled and poked the elephant with a long wooden pole with a pointed metal spike on the end. The words, “Stop! I don’t need to feed him! Just let him rest” were coming out of my mouth when Peter stopped me. He was right to stop me. I wanted to rewind and pass on this activity but our guide Sam was trying so hard to make this a memorable experience for us. He was doing an exceptional job and I didn’t want to upset him or make a scene. As you can imagine- An elephant getting off its side looks like I do trying to get out of bed with the flu. Very slowly and with great difficulty. I felt terrible that we were the reason this animal had to get up. From my perspective this river rest was the happiest part of his day. When the animal rose and came out of the water I noticed that he had chains resting on his neck. A disheartening site for sure. But then I thought, with limited funds, how else you keep a giant animal from wandering off into the jungle? My experience with the elephants was a toggle between astonishment and concern. I wish I knew more about these animals to actually write an educated observation of how the elephants are treated. I don’t think anyone with a love for animals could visit Pinnewala and not question, at least to some extent, whether these animals are happy. The Sri Lanka board of tourism promises that “the elephants at the Orphanage aren’t subjected to any form of stress, abuse or threat and are supported by a team of employees numbering to over 100.” I soooo want to believe this. But then I read articles like this and I can’t help but feel like these animals could have a better life. I am not an animal rights activist, nor am I a vet, nor do I have an alternative solution. After the animals are finished bathing in the river, the handlers lead an impressive march back to the orphanage. The orphanage provides tourists with more opportunities for close contact with these beautiful creatures. 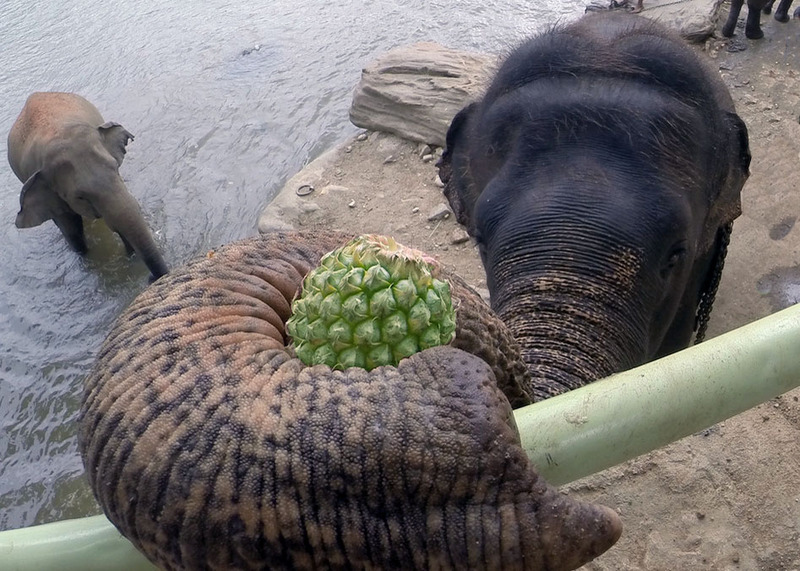 Sam arranged for Sage to bottle feed a baby elephant and it was because of Sam that we had the special opportunity for a little tug-o-war! Check out the 3 minute highlight video below. This entry was posted in Asia, Sri Lanka and tagged Elephants, Pinnawala, Sri Lanka. Bookmark the permalink. What a great experience!!!! You’re so lucky! !